What can be more joyful than having a good, old sing with your friends? Karaoke is successful for a reason! Singing clears out your lungs, sparks up the brain, gets those happy endorphins flowing, creates a sense of community – from doing something wonderful together. We sing for the sheer pleasure of it. But singing also helps to teach rhythm, listening skills, turn-taking, posture and body control, the expression of different emotions and, of course, movement – whether through dancing or specific actions. 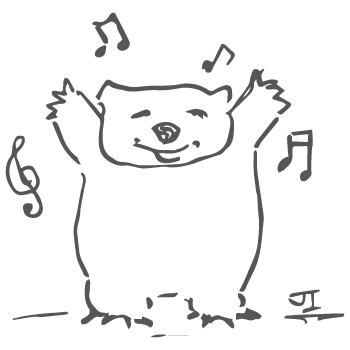 Dancing Wombat’s songs are short, for quick and easy learning! This is also why they rhyme. As students pick up the rhyme patterns, they are often able to predict, from the context, which word might be next. This also helps with memorisation and is a confidence-builder.